I was glad to find out yesterday that Mindsystems has decided to develop a new version of Amode. I’ve written about Amode V2 before, explaining why I like it as a project management solution. I can only hope that Mindsystems will preserve their unique tree + Gantt + calendar integration, which is the main reason why it’s my preferred project management tool. Mindsystems are offering a discount to existing and academic users, and the price should be even lower if you buy it from outside of Australia, as you shouldn’t have to pay the tax. Mindsystems have been kind enough to contact me today “To confirm the multi-view will be a strong feature of the new design.” That is really good news. I have tried several project management software but Amode is the only one I’ve seen where you can choose to construct your project in a hierarchical tree, a Gantt chart, or a calendar, and it only takes one click to switch between them. Got word a few days ago from Mindsystems that development of Amode has been suspended due to lack of sufficient market interest. Too bad. 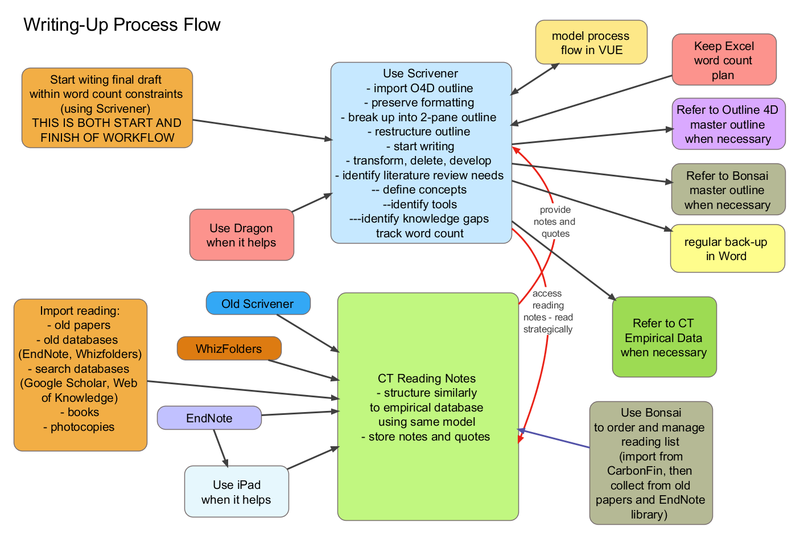 Recently I’ve been finding that whenever I’m stuck in my odyssey towards writing up my dissertation, modelling my process flow in a concept-mapping software (such as VUE) usually helps. In this (hopefully) final stage of my PhD project there are so many resources scattered around in various software and folders on my computer that I need a formal “concept map” (if that’s the right term) to pull them all together and work out the relationships and interactions between them. Here is for example my last concept map that I’ve knocked up when I was unsure how to proceed with writing up the first four chapters of my dissertation. 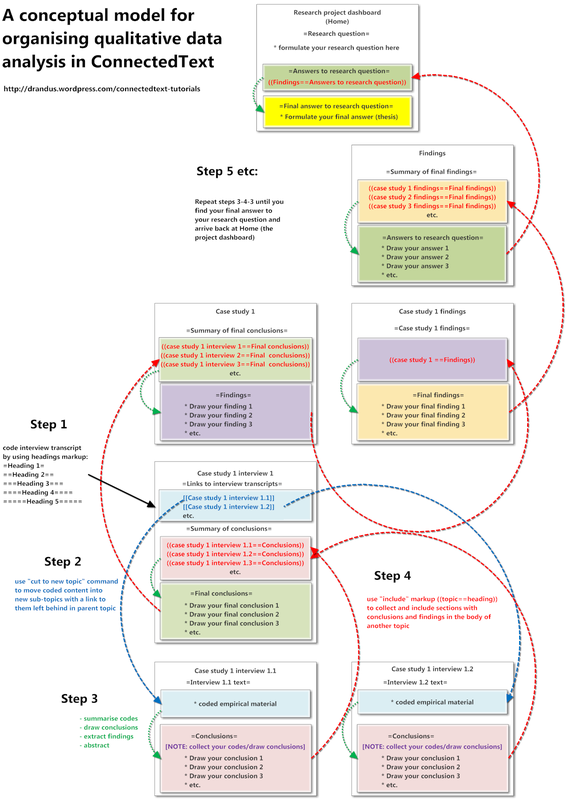 There is nothing particularly scientific about this map and it probably doesn’t follow any of the conventions of process workflow modelling. But who cares: it did the trick and allowed me to plan out the next stages of what I need to do. Actually at least 2 or 3 days of deliberation are captured in this chart. First, I needed to decide whether I was going to use ConnectedText or something else for doing the actual writing. Through trial and error I established that it’s better to use another software because however much I love working in CT, it does have some limitations. One of them is that you can only have one instance of CT running and only one edit/view window open. Since I’ve decided to use CT as my database for my reading notes, I need to use another software, so I can be writing in one software in one monitor, while referring to the CT notes in the other. Also, there isn’t an easy way to track the word count of your document while writing in CT. I had considered WhizFolders briefly as an alternative, but I find its interface too busy to be able to concentrate on the actual writing. So I settled on Scrivener for Windows, which works well both as a two-pane outliner and as a writing tool with decent word-count tracking. As the sequence of the process flow is not apparent from the chart, let me describe it briefly. I start with importing my master outline with inline notes from Outline 4D (via Word). The reason I created my outline in Outline 4D is because it is a single-pane outliner that allows you to have inline notes, which you can also view in an index card view on a corkboard. Then I use Scrivener to break up the imported document into a 2-pane outline using Scrivener’s handy “Split with Selection as Title” command. As I start writing the actual text (I’m working on the first 4 chapters of my thesis, which need to be contextualised within their respective literatures, namely the Introduction, the Literature Review, the Conceptual Framework, and the Methodology), I begin to review my existing reading notes. Over the years I have read all kinds of things that are no longer relevant. Therefore I need to deploy some kind of a filtering process to select the most important notes, as well as any new reading that still needs to be done. To consolidate my final reading list (a list of bibliographic references), I use a Natara Bonsai outline. First I import into Bonsai an existing outline document that contains some of my selected references that I have kept on my iPod/iPad in CarbonFin Outliner. Then I go through my old conference papers and other writings to extract references that are still relevant and which are kept in Word files and an old Scrivener project. Simultaneously to this process I have also designed a ConnectedText project for keeping my final reading notes and quotes, using a similar model to the one I have developed for my empirical analysis. As my old reading notes and quotes are kept in a WhizFolders database, I will need to review those and transfer them one-by-one to the CT database (I deliberately don’t want to import them en mass, as I need to separate the wheat from the chaff). I will also use the CT project for recording any new reading I still need to do. I am designing this CT database not simply just for this writing project. Very likely it will become my main database for all my future readings for years to come. This is just an opportune moment to get started with it, as I no longer want to use WhizFolders for this. Getting back to the chart, there are basically two important elements to it: 1) the big blue Scrivener rectangle which represents my writing, and 2) the big green rectangle below it which represents the CT reading notes database. If we look at the arrows pointing to the latter, we see mostly the data that needs to be transferred (by carefully sifting through) from my old files, as well as new reading notes that will be created in iPad. As for the arrows coming in or out of the Scrivener project, those have to do mostly with referring to external sources. In the end I won’t need Excel for planning the word count because Scrivener has good enough tools for that. I will also use Dragon NaturallySpeaking for dictating, whenever I feel the need. Sometimes it’s easier to write without it, other times it speeds things up. As for EndNote, it is simply the central database for my references, which are linked to the PDFs that may need to be read for the first time or reviewed. But my main point here is that it was the creating of this concept map that was crucial for getting me started with the whole writing stage. Without it I would have probably sat in front of a blank page with a writer’s block for days. Now I feel fairly confident that I know what I need to do next. I have described the chart below that depicts my use of ConnectedText (CT) for qualitative data analysis as representing a “conceptual model” and “a process flow.” But these terms don’t quite get the idea across that in fact CT had allowed me to construct my very own data analysis machine. Once you have the basic structure and the logic of this system set up in CT, it works almost like a “sausage machine” with some filters put in. All you need to do is start pumping your empirical data in at Step 1, and as long as you follow the procedure and apply your theoretical filters during the abstraction process, the machine guides you through the production of some “truths,” i.e. your qualitative findings, the answers to your research question. This brings me back to my earlier points (here and here) about why I prefer to do my qualitative analysis in CT, rather than in Atlas.ti or NVivo. There is no question that those other two dedicated CAQDAS software have more data analysis features and capabilities than CT. However, CT trumps them in one regard hands down: rather than just allowing you to analyse your data, it in effect allows you to create and operate your very own research tools, such as my “idea-sausage machine” below. Check out my tutorial here, if you are interested in creating your own research tool. Why use ConnectedText for qualitative data analysis? This is my first post in what hopefully will become a series of posts on how I use ConnectedText (CT) for qualitative data analysis, as part of my Ph.D. project. You may ask: “Why bother using CT, a personal wiki, for qualitative data analysis when there are such long-standing dedicated CAQDAS tools on the market such as Atlas.ti and NVivo?” That is a legitimate question. Some people may indeed find that Atlas.ti or NVivo works better for them. However, based on my personal experience as a PhD student, I found that neither Atlas.ti or NVivo was quite right for me. Finding CT was a revelation, as it allowed me to overcome some problems (more about those later) that I couldn’t solve with NVivo, my CAQDAS of choice prior to CT.
How to select a CAQDAS for your study? Try several if you can. Test them on a pilot project. Take workshops on them. Although here I will be recommending CT as CAQDAS for particular qualitative analysis jobs, I still suggest you use either Atlas.ti or NVivo extensively for a prolonged period of time to learn about how mainstream CAQDAS work. What was my experience with CAQDAS? I took a couple of workshops in Atlas.ti, got a copy and trialled it repeatedly over the years. As far as I know, Atlas.ti was originally developed to implement grounded theory, and as I wasn’t completely convinced by its implicit research philosophy (which still seemed a bit positivist to me, although otherwise I’m all in favour of grounded theory’s bottom-up approach), I found some of the lingo, the design and the interface off-putting. I discovered that I was a visual learner and found that Atlas.ti wasn’t accommodating my type of learner. I found it difficult to visualise the conceptual linkages between Atlas.ti’s various commands and floating windows. Why did I abandon NVivo? The main reason had to do with the limitations of NVivo’s interface, or rather the way its tools are organised and the way this organisation forces you to follow a particular analytical logic. The underlying issue is the hierarchical organisation of folders and tools, which, ironically, was the reason I chose NVivo over Atlas.ti in the first place. The problem was that different elements of the work get separated into different folders, which can’t be viewed at the same time, thus breaking up the workflow and the analytical reasoning. After all my coding I ended up with a hierarchical forest of codes (a lot more complex one than the example in the above image) and it was difficult to see how to bring them all together again in order to synthesise them into findings and a coherent answer to my research question. I was stuck and confused, as I also lost my overview of all the data that I had reviewed and stored in there. (In fact, in my desperation I took screenshots of my NVivo codes and pasted them into PowerPoint, and continued the rest of the work outside of NVivo. It helped to cut a Gordian knot but I still ended up needing another CAQDAS solution for the rest of my data). I also realised that NVivo is a wiki forced into a hierarchical straight-jacket. You are essentially creating links between different documents and then these links are presented to you in a hierarchical organisation. This rekindled my interest in personal wikis again. Since the early days of my PhD I wished that there was a way to create a dashboard for my dissertation project, from which all my files (both data and my analysis and writings) would be linked in the manner of an intranet. I have experimented with Planz, WhizFolders and a range of desktop wikis but none of them were quite right. In fact I also checked out ConnectedText a few times over the years but I never managed to make sense of it. However, my problems with NVivo’s hierarchical structure convinced me to have another go with the wiki format. Fortuitously, there were a series of helpful posts on Outliner Software and on his blog by Steve Zeoli, which finally led me to an epiphany with CT. But more about that in my next post. There were some other reasons too why I was happy to say good-bye to NVivo (and the same is true for Atlas.ti). One was the enormous price tag and their licensing regime. Although I got a very cheap, subsidised license from my university, it needs to be renewed annually, and after I graduate I may need to shell out some serious money if I want to have continued access to the data in the form it’s organised in NVivo. To me it seems that NVivo and Atlas.ti to some extent cornered the market and are taking advantage of the fact that PhD students are a captive audience, strongly influenced by the preferences of their supervisors, peers and academic tribes. This business attitude I find very unappealing. Finally, there are the resource requirements of running a software like NVivo. When I installed my first NVivo copy onto my previous computer, a laptop, I wasn’t even able to launch it. It just simply wouldn’t budge and froze my entire machine. I was forced to buy a top-of-the-range PC in order to be able to run it, and even on the new machine it was sluggish. Waiting for files and windows to open for several seconds eventually adds up. Also, as far as I know, all the work in NVivo is saved into a single proprietary file. It is just asking for a lot of faith to put several years worth of data and effort into a single massive file and hope that it will work for 100% of the time forever, that it will never get corrupted etc., etc. I’m not a techie but it seems to me there are some risks associated with that approach. 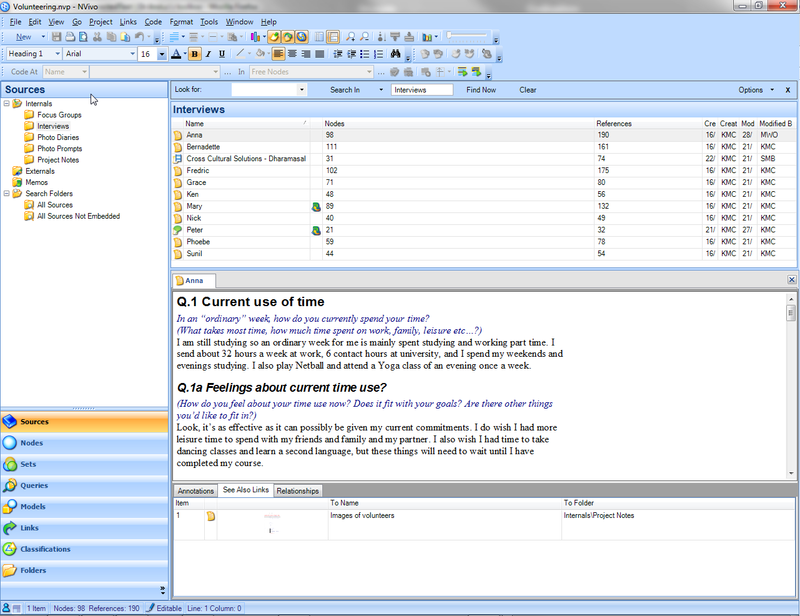 Still, I’m glad that I had a proper go with NVivo. It was only by spending many months toiling with it that I had learned how CAQDAS work and what the features are that I like and the ones that I would like to have. I was only able to adopt CT as my new CAQDAS tool because I was able to model the processes that I learnt about – or wasn’t allowed to do – in NVivo. In my next two posts I will introduce the key qualitative data analysis features of CT and I will also provide some tips on how to get started with it, especially if you had never worked with a wiki before. 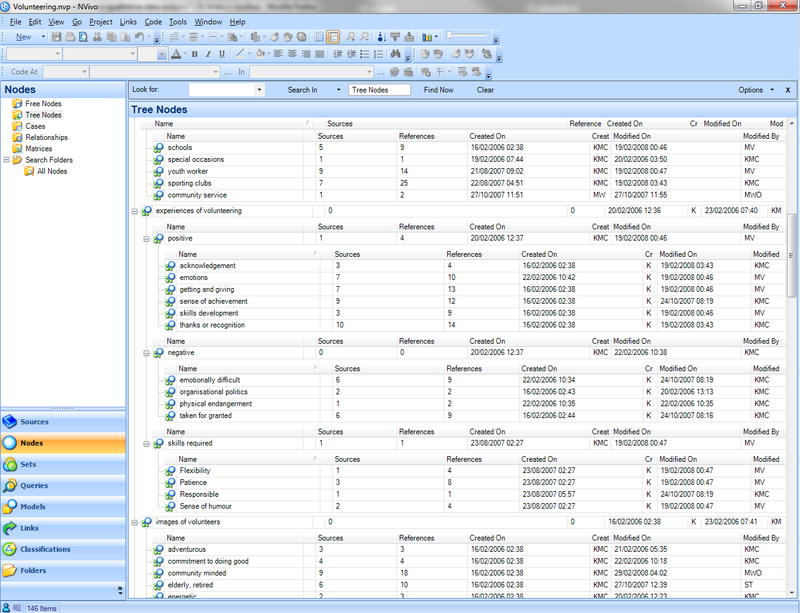 I use Mindsystems Amode V2 for managing the overall PhD project. It’s not the only project management tool that I use but it sits at the top of my project management system hierarchy (see my other PM tools here). I have my entire project mapped out in it and I monitor its progress daily, amending the tasks and completing them. I put my main Amode file into Windows’s Startup folder, so that it starts up every time I restart the computer (it’s a way of having it in your face every morning). The reason I chose Amode over other competent project management tools (and I’ve checked out a few – see the discussion surrounding the search process here) is that it is reasonably simple to use for a single personal project, such as a PhD dissertation (although Amode also can handle several open projects through its tabbed interface). Other PM software I found too bloated, as they try to cover every imaginable PM scenario from building bridges to organising NASA space missions. Amode on the other hand is sophisticated enough to give you the main PM functionalities (the Tree, which serves as the work breakdown structure, the Chart which is a proper Gantt chart, and the Calendar, which is integrated with the other two) but it’s also simple enough for everyday use. In fact I probably only use 10% of Amode’s functionality but I’m very happy with it as a PM tool. I thought it’s worth mentioning that if you are buying this software from outside of Australia, then you don’t have to pay their GST (tax), so the price should be considerably lower.